Personal profile: Lin Yifu was the first Chinese to receive such a high position at the World Bank or the International Monetary Fund. The mainland Chinese economist who has published the most papers in foreign economic journals so far. 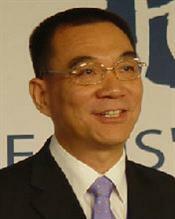 Lin Yifu plays a very important decision-making role in the development of research plans and development directions. 2018-12-18 The list of reform pioneers was announced? What are the economists Li Yining and Lin Yifu? 2018-12-13 Why can China, after the reform and opening up, be the most eye-catching among the 13 economies? 2018-10-17 For the promotion of Chongqing's green finance construction, “the bricks and tiling”, Lin Yifu and other big coffee help out, the storm of wisdom is about to strike. 2018-09-28 Lin Yifu: The opening of the banking insurance industry plays an important role in supporting the real economy. 2018-09-16 Lin Yifu: China has the potential to grow at an annual rate of 8% in the next 20 years. 2018-06-05 Lin Yifu: China’s growth of around 6.5% in the next decade is entirely possible. 2018-06-05 Lin Yifu: China is still likely to maintain a growth of 6.5% in the next decade. 2018-05-29 Lin Yifu: Different industry types need to correspond to different innovative methods and financial support methods.